Judicial system's ombudsman says there was no ethical problem with Supreme Court President hosting NIF heads. 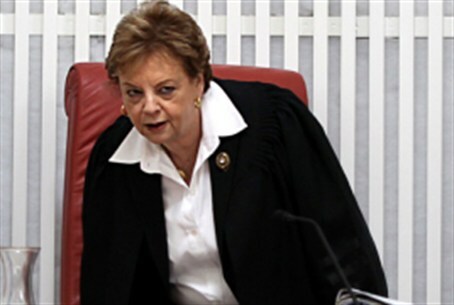 Supreme Court President Dorit Beinisch did not receive a contribution from the Ford Foundation on behalf of the New Israel Fund, Court System Ombudsman Judge (ret.) Eliezer Goldberg determined last week. News site News1 reported that Goldberg based his findings on Beinisch's version of the episode only. The Ombudsman received three complaints in late November, based upon a photograph that appeared in the NIF website. According to the complainants, the text under the photograph said that Beinisch had received $20 million on behalf of the NIF from the Ford Foundation. The photograph was taken on September 17, 2007, on the 15th anniversary of Shatil, the NIF's operational arm. The picture shows a beaming Beinisch with Susan Berresford, then-President of the Ford Foundation. Behind them, according to MyRightWord's Yisrael Meidad, are Israel Executive Director of the New Israel Fund, Eliezer Yaari; NIF Board VP in Israel Neta Ziv; Ford Foundation Deputy Vice President, Program Management David Chiel; Ford Israel Fund Director Aaron Back; and NIF CEO Larry Garber. The complainants noted that the NIF website has since blocked access to the photograph. Goldberg called the complaints "baseless" and said there was "no connection between them and the true facts." Beinisch told him that she regularly meets representatives of different organizations, from all parts of the political spectrum. She said that the NIF asked to coordinate a visit in the Supreme Court for the Ford Foundation's president and that "I met them briefly in the oval room in my bureau… The complaints that I received a $20 million donation on behalf of the New Israel Fund are a false, malicious and baseless libel…"
News1 reports that Goldberg accepted Beinisch's version of events unquestioningly and determined that the picture documented "a short courtesy meeting" and nothing more. NIF-supported organizations such as the Association for Civil Rights in Israel, Adala, the Women's Lobby and Itach (which is headed by Neta Ziv, among others) regularly petition the High Court and appear before Beinisch as litigants. They hold major responsibility as well for the damaging UN Goldstone Report on Operation Cast Lead in Gaza.